One of the most significant, easy to use and versatile iPhone, iPad, and iPod touch 5+ accessories we have come across in a long time! We really hope they meet their goal and can't wait to see what kind of stretch goals they come up with. For just $25 you will receive a Micro adapter and the Mag adapter( I have pledged for one and I am awaiting instructions on how to multiply my pledge), or you can pledge for the battery case as well or the whole shebang a dock battery case and adapters. If you decide to back them, please leave a comment on their campaigns comment page that you found their project through IamABacker.com , Thank you. 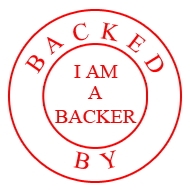 You can Download our new app; I am A Backer and follow IamABacker on Twitter, Facebook, or RSS to be notified of any updates. Cabin is the slim aluminum portable battery for iPhone that attaches magnetically for an unobtrusive and simple recharging experience. We encourage you to watch our video above and read the explanation below for more details. We hope by the end, you'll agree with us that Cabin provides the best portable charging experience yet. At the beginning of this project we asked ourselves one simple question: How can we build a better portable battery for iPhone? Wrap-around cases with integrated batteries can be big, bulky, and ugly, and separate external batteries must be connected using a Lightning cable, making them a pain to use and hold when on the go. So what’s a better way? This questioning forced us to rethink the typical portable battery design and ultimately led us to Cabin, a portable battery that offers an amazing charging experience without compromising iPhone’s size and design. Simply Magnetic. The key to Cabin’s ease-of-use is the magnetic connection between iPhone and Cabin. By designing a special MicroAdaptor for the iPhone’s Lightning port which magnetically attaches iPhone to Cabin, we have made the connection and charging process, if it may be said, incredibly delightful. Cabin is solid, precise, and easily attachable/removable. Easier Than Ever. No more tangled wires or awkward external batteries; Recharge your iPhone simply by resting the iPhone in Cabin, or recharge both separately or simultaneously using our Cabin Dock. Svelte and Well-Crafted. Cabin is much smaller than common wrap-around battery cases. Instead of engineering just another case, we use magnetic connections, edge-covering frame, and aluminum unibody construction to keep Cabin small and simple to use. Beautiful Finish. Cabin has been designed to accentuate the incredible beauty of iPhone. Its aluminum unibody construction and hidden LED indicator makes Cabin a compact, yet useful product. Hold Comfortably. Its suitable size, aluminum unibody construction, and humanized design make Cabin feel great while in your hand. Safety By Power. Cabin’s high quality 2200mAh battery extends iPhone’s battery life by about 130% with the same charging efficiency as Lightning cable. Cabin uses a customized battery cell certified by international safety standards and a top-level circuit protection cell that is the same as that of commercial smart phones. The metal shell also ensures high structural strength. Alongside Cabin, we have also designed the Cabin Dock for simple desktop charging of both Cabin and iPhone. Put On and Go On. Thanks to our MicroAdapter, placing iPhone directly on the Cabin Dock is as easy as putting your phone on the table. An iPhone and attached Cabin battery can also be placed on the Dock together, charging both in the process. Charge and Sync. Not only does the Dock charge iPhone or iPhone + Cabin but it also provides data synchronization during the charging process if connected to a computer through the USB port. Seamless Design. Cabin Dock was designed alongside the Cabin battery to ensure seamless use and a coherent experience. Just like Cabin, we are using the best techniques and components to make Cabin Dock a great compliment for the iPhone. Minimal but powerful. We have designed a Dock that is beautiful and useful while taking up very little desk space. In the meantime, it has the high efficient charging ability just as the Lightning cable. "MagSafe" for iPhone. Our passion for improving the charging process has even extended to improving the Lightning cable itself. Our MagAdaptor for the Apple Lightning cable magnetically connects to our iPhone MicroAdaptor or Cabin, offering the same great charging experience as MagSafe for MacBook. Connect without Thinking. Just like MagSafe or Lightning cable, it doesn’t matter which orientation the MagAdaptor and MicroAdaptor are connected. So need to connect iPhone while driving in the car? Simply get Lightning cable with MagAdaptor close to the base of your iPhone and the two will snap together magnetically for a safe and hassle-free connection experience. For us, good is not enough and every design detail must be perfect. That is why we have spent the past two years designing Cabin. Over these two years we said goodbye to cheap plastic and decided instead to use aluminum. We rejected MicroUSB for a better connection method. We refused a complex solution and instead sought simplicity. All this care led us to a wonderful charging solution that is useful in a variety of situations, from at home to on the side walk to in the car. All this care led us to Cabin. HEVO LABS is a dedicated, professional team from Shenzhen, China. We believe new products should be original, imaginative, useful, and gorgeous. Our goal is to create elegant products that simplify life and make our current technology more effective. Shenzhen is the current heart of world electronics manufacturing and is a paradise for both fans and makers of new technology. Our location in Shenzhen allows us amazing access to the world's best suppliers and manufacturers, helping us turn our dreams into affordable, high-quality products for you. Future Plans. We have already begun preliminary design work on Cabin for iPhone 6. This Cabin will be thinner and yet able to hold greater capacity. Please note that our current Kickstarter is only for an iPhone5/5s-compatible Cabin. With your passion and support, we hope to complete Cabin for iPhone 6 as early as possible. July: Complete detail design work for the mass-produced version of Cabin, make the procurement plan for cells and the internal circuitry components. August: Produce the mould for plastic components, work on CNC machining of aluminum components, and produce the PCB (printed circuit board) and complete PCBA (printed circuit board assembly). September: Finish the surface treatment for metal components and mass-produce and assemble the plastic components. October: Check the quality of all components, complete final assembly, test and package the final product, and deliver Cabin to all our wonderful backers! Sense Know More. Sleep Better.